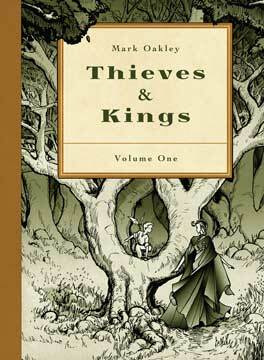 Thieves and Kings is a thrilling Fantasy, told through an innovative mix of prose and artwork. After returning from an apprenticeship across the sea, Rubel returns to the city of Highborn and declares himself a thief. He soon finds himself caught up in a life or death adventure across Oceansend, battling knights, sorcerers, and the mysterious Shadow Lady. Everyone has an agenda, and the truth is hard to come by in this high-fantasy adventure for all ages. Mark Oakley worked in animation for years before, enthralled by the idea of having complete control over a project, he moved to Wolfville, NS, and started drawing comics. His major works include Thieves & Kings and Stardrop.